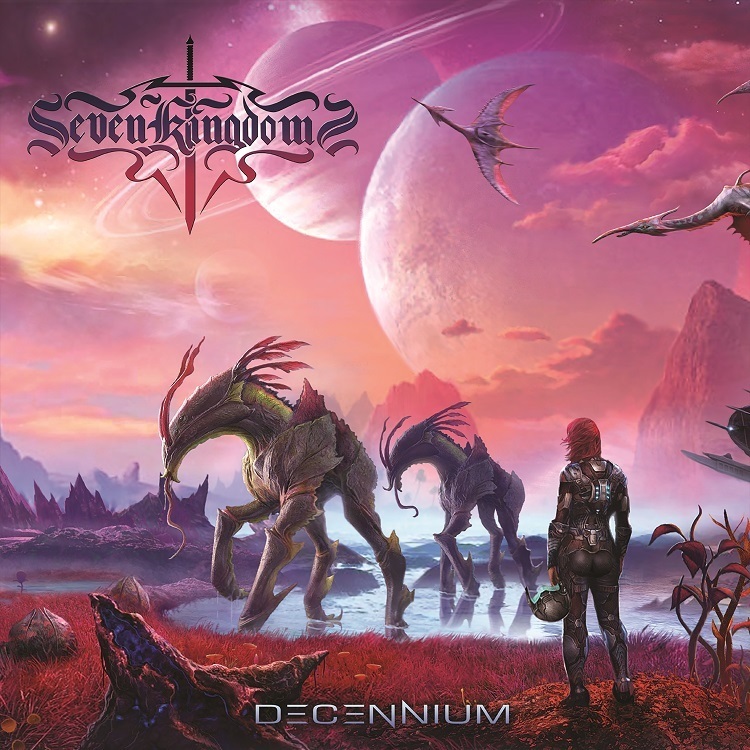 Heute erscheint das neue Album der Epic/Speed/Melodic-Metal-Band SEVEN KINGDOMS aus Florida. Exklusiv für Popmonitor haben Sängerin SABRINA VALENTINE und die Gitarristen CAMDEN CRUZ und KEVIN BYRD sowie Songwriter BRYAN EDWARDS die zehn Songs von Decennium kommentiert – darunter auch die epische Single „Kingslayer“. Das Video präsentieren wir als Weltpremiere im deutschsprachigen Raum! Deathface Ginny is one of the main characters of Pretty Deadly, a comic book series by Kelly Sue DeConnick and Emma Rios. This song was inspired by her origin story and the first arc of the series. It’s a tale of revenge and destiny set in the old American west, told through the lens of folklore and with a little love for spaghetti westerns. I’m always drawn to strong female characters in fiction, so I couldn’t help myself sharing a song about the reaper of vengeance. This is a song about Jaime Lannister’s betrayal of his oath, which earned him that very nickname across the Seven Kingdoms. The Mad King was ready to blow up all of Kings Landing with stocks of wildfire hidden under the streets, rather than face defeat to Robert’s rebellion. Having already seen enough atrocities committed by the king, Jaime could not stand by any longer with the lives of the entire city at stake. He murdered the Mad King, the one his life was sworn to protect. Instead of becoming a hero, this betrayal would be how history remembered Jaime Lannister. This song is very personal to me. It’s very human, dealing with basic emotions and everyday struggles. Feeling lost in life, alone, uncertain. This is how I was feeling while I was writing. I really poured my heart into this one. I wanted to go for a different feel, musically. Solid, driving, not necessarily fast in a Power Metal sense. The drums and bass have some of my favorite moments and overallI’m super happy with how this one turned out. I think we all really nailed it… Fun fact: The pic slide during the intro was performed by Sabrina. This is another song that was one of the first to be done on this album. This song is inspired by Frank Underwood’s (and his wife’s) Character in the Netflix Series, House Of Cards. This is one of my favorite series of all time. I must have watched all the seasons about 4 times! haha The idea that everyone is really just out for themselves and their own ideals should hit home to most anyone, and we can all relate to some form of political woes in one way or another. Nothing stands in the way of the Underwoods. They are able to make whatever needs to happen, happen, no matter the circumstances… which is a good and bad trait at the same time. Who would actually be shocked if our real government was actually exactly like House of Cards? I sure wouldn’t be shocked! haha. Strength is the biggest trait of the Underwood’s, but if you were in their position, What would you be doing? Would power spoil your morals? How do you cope not being able to make everyone happy? In the end, would that even matter to you? This is a song about exactly what the title says. We went through at least 8 or 9 full sets of lyrics for this song and none of it was ‚right‘. Kevin, Bryan and I all went through what seemed to be a lifetime of trying to make words fit right. What you would call ‚Writer’s Block‘. We all ended up getting frustrated and passing it off to one another. In the end I remember talking to Kevin and both of us coming up with the idea at the same time saying, „Hey, what if this song is actually about having writer’s block and the struggle we go through to make something fit the way it should“? The second that concept came to mind, the words just magically appeared. They ended up fitting nicely, with the help of Sabrina coming up with the title of the song! At the end of the day, as a musician sometimes the biggest pains become your inspiration, and this song is a testament to exactly that. So here is a story, Awaken From Nothing..